Reality and Fiction: The culture of not hearing "no"
Yesterday I had a phone call from an insurance sales rep, trying to persuade me to upgrade my insurance policy. I explained that we can't afford to pay any more for insurance, and that we have policies in other companies too. Nothing seemed to be getting through, and he just kept up the sales pitch until I hung up. Then he called back and said, "The call seems to have been disconnected". I told him that I was trying to say "no" to his offer, and he said, "You didn't have to hang up, you could just say that you're not interested!". So I said, "I'm not interested, thank you", and he finally accepted this and ended the call. This got me thinking about how difficult it is for people nowadays to hear "no". We are often taught to stand up for ourselves and learn how to say "no" to things we don't want, but at the same time we are not being trained to hear and accept when other people say "no". It starts in childhood. Parents nowadays seem to think that children will be permanently damaged by hearing any rejection. Children learn that they can always get their own way eventually. I remember when I was growing up a request had two possible answers, "yes" and "no", and it if was "no", that was final. Sometimes I got an explanation for the "no", such as "we can't afford it" or "we don't have time", but even without any explanation, I had to accept the "no". This was a good preparation for reality, in which people can't always have everything they want. I grew up knowing that I was not the centre of the universe and that other people had needs and wishes, too. 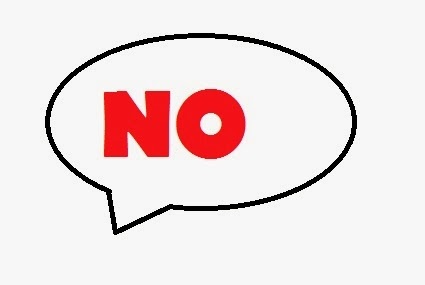 Another major culprit in the culture of not hearing "no" is sales training. Sales people are taught to "overcome resistance" and have answers for any "objections", and they often become persistent to the point of harassment. This approach has leaked into general life, where people are encouraged not to take "no" for an answer and to keep on trying until they get what they want. Sometimes this stems from a sense of entitlement, and sometimes this sort of persistence is seen as the sort of "hard work" that deserves to be rewarded. Ultimately, the inability to hear another person's "no" reflects a very self-centered culture in which the self is considered much more important than the other. Selfishness has become not only accepted but cherished, while empathy and consideration are often considered signs of weakness. People who think only of themselves and cannot hear another person's "no" may end up accused of sexual assault without understanding what they did. In the same way the sales rep yesterday couldn't understand that I was refusing his offer, I think it is possible that some men don't understand a woman's "no" in more intimate situations. I know that I often feel "raped" (metaphorically) by aggressive sales reps and selfish people in general. One of the most important things we can teach and learn in life is the importance of listening, of really hearing and seeing each other, and having empathy and understanding for others even when this is inconvenient for our own desires. I hope some way can be found to get this message across before society becomes even more selfish and aggressive. I know what you mean. Some years ago when things were financially better sales representatives from banks called in the middle of your afternoon nap to offer you a credit card or a loan. Now it is phone company representatives who are trying to sell a new phone contract. They don't accept a no. I always try to be gentle, I realise they have to do their job but in the end it is my time and my phone line they are taking advantage of. As for children I couldn't agree more.AriadnefromGreece!